The gilets jaunes (“yellow vests”) continue to demonstrate throughout France, extending what had been planned as a one-day traffic-stopping action to protest fuel tax hikes. Demonstrators have blocked access to ports, refineries, and oil depots. This, in combination with the highway blockades, has led to fuel shortages and closure of fuel stations in some places. A set of highway tollbooths were set aflame in Virsac. On the French island of Réunion, near Madagascar, schools and government buildings are closed today, and the airport is shut down, as yellow vests blockade the highways. The government has announced a night-time curfew through the week. Commerce in general has slowed, with many consumer-oriented businesses reporting 20–40% drops in business. Frequent updates on the demonstrations can be found at BFM TV. 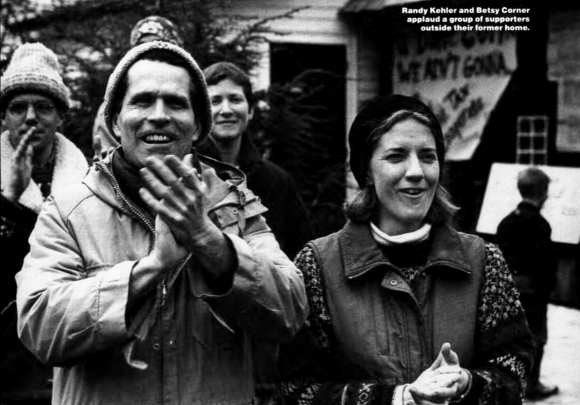 In 1989 , the U.S. government began the process of seizing the Colrain home of war tax resisters Randy Kehler and Betsy Corner. War tax resisters fought back, with protests and a nearly two-year occupation of the home that galvanized the movement. Last weekend, veterans of the Colrain actions met at the annual gathering of New England war tax resisters in Deerfield, Massachusetts. 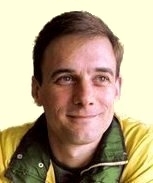 Among those who participated was Terry Chranesky, who at the time was one of the antagonists in the drama — having purchased the seized house at auction along with her husband, but who is now reconciled with those she once clashed with. Ruth Benn shared her initial impressions of the gathering on the wtr-s mailing list. Randy Kehler and Betsy Corner applaud a group of supporters outside their home during the attempted IRS seizure. Some notes from a fuel tax protest in the U.K. in 2000 that featured blockades of refineries. 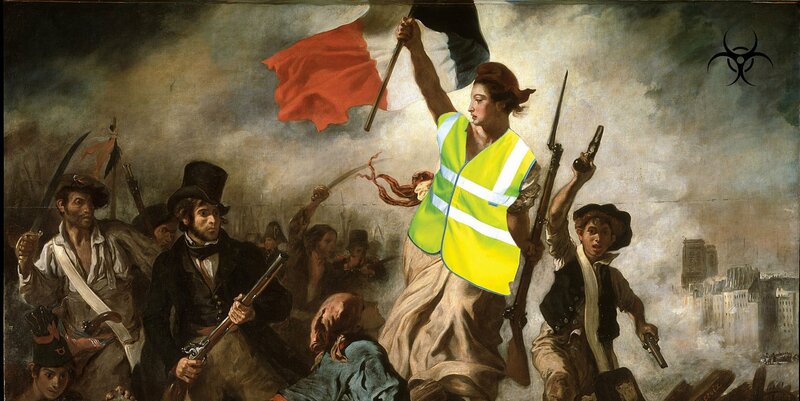 A grassroots anti-tax movement calling itself gilets jaunes (“yellow vests”) is blockading roads, highways, and rail transit throughout France today in a planned, one-day demonstration. The Gilets Jaunes movement succeeded in forcing the French government to delay the implementation of new taxes on fuel. Also: Is a society governed by law so fragile and valuable that law should be prioritized over conscience when the two conflict, as Captain Vere argued in “Billy Budd,” or is the opposite true, as as Thoreau famously argued in “Resistance to Civil Government”? Aristotle introduces his opinion on this in his critique of Hippodamus’s utopia.